Some of the initiatives for that takeover were being aired at the CRF’s “fringe” farming conference which took place in Oxford this week, voicing polite but forceful protest against the high production objectives of the mainstream Farming Conference in the Examination Schools next door. According to CRF founder Colin Tudge, if we are serious about feeding 9 bn people in a few decades’ time, the current food production system, which is designed to make money, has to be dismantled in favour of small scale, labour intensive farming, which is designed to feed people. Like any reform movement, this “agrarian renaissance” is about wresting power away from existing authorities and it has set its sights on, amongst other things, the constellation of laws and regulations governing the cultivation of food. Foremost among the Real Farming Campaign’s concerns are waste and depletion of limited resources, significantly land; and arguably nothing encapsulates these problems more forcefully than the Europe-wide ban on feeding catering waste to farm animals. The following is based on a paper I gave to the conference on the subject. So this is caught by the ban which covers products of animal origin, or foodstuffs containing products of animal origin, irrespective of whether the catering waste contains animal by products (surplus vegetable, fruit or bakery products). This leads to defensive regulation by public authorities whose task it is to make sure that commercial enterprises in their jurisdiction do not breach EU law, preventing the supermarkets from separating non-protein waste to supply the agricultural feed manufacturers with perfectly safe, non-ABP former foodstuffs. Third, this is a draconian imposition of criminal liability on an activity we are all being urged to prioritise – resourceful recycling. A cursory glance at the Defra website will reveal how swift and fierce the retribution will be to anyone feeding food scraps to farmed animals, no matter how small the operation and how innocent the scraps. Anyone with a few hens pecking away in the backyard needs to look sharp: a “farmed animal” for the purpose of the Regulation means any animal kept for the provision of food, and a couple of eggs a week may bring a Defra van trundling up the drive at any moment. And the fourth and final reason why this is such a cause for concern is because the source of this draconian legislation is a Regulation, not a Directive. Any student of EU law will know that a Regulation is virtually unassailable by way of judicial review, since it occupies in the EU hierarchy a place analogous to primary legislation in national law. To cross the threshold of admissibility anyone challenging the legality of a regulation has to prove that they are “individually concerned” by the measure (Article 230 EC). An attempt was made by animal feed operatives to annul or at least challenge the ABP regulation in 2004; the ECJ rejected the challenge without even opening oral proceedings. If the applicants in that case that specialized in the conversion of catering waste into animal feed – were not “individually concerned’ by a measure that banned the entry of catering waste into the food chain, it is hard to see who is. And even if such a challenge were to be admitted for consideration, it would be defeated at the first hurdle of legality, since the legal basis for this instrument is that old EU shibboleth, public health. As Fairlie points out, the historic figures for outbreaks of disease in farmed animals suggest that the connection between the ban and public health is highly debatable. During WWII waste food was routinely fed by pig keepers to their stock the incidence of swine fever actually fell. The real menace is not swill, but concentration of large numbers of animals in confined spaces – you don’t have to have a PhD in epidemiology to grasp the fact that pathogens flourish in intensively stocked farms and long distance animal trading. and the leading businessman and food consultant Lord Haskins was widely quoted as estimating that in the UK we throw away about 20 million tonnes of edible material – half of all the food produced. In the strange looking-glass world of the EU, rafts of laws are proposed and produced enjoining us to recycle, limit landfill, restrict incineration, cut down on carbon emissions and save energy. 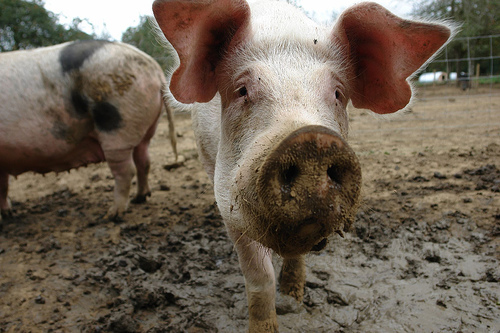 At the same time one of the chief engines of energy waste – the regulation banning pigswill – is not only being retained but has been renewed in its full force (Regulation 1069/09, due to be implemented in March by the Animal By-Products (Enforcement) (England) Regulations 2011). Taking into account the CO2 emissions of food waste incineration, the deforestation caused by feeding soya to pigs, and the calorific value of the stuff we have to burn instead of turning into pork, this is lunacy law. Note: there are now moves afoot to lift the ban on the use of meat and bonemeal (slaughterhouse render, otherwise known as MBMs) in food for farmed pigs, poultry and fish, to alleviate the pressure on farmers to supply high protein foodstuffs to non-ruminant livestock: see the Commission’s draft amendment. However the ban on catering waste from institutions, restaurants and kitchens remains in force and as yet undebated. Is the planet our neighbour, in law? You are absolutely correct. If the FMD outbreak was really from improperly cooked pig swill (which contravened the then current law) the response should have been to tighten up monitoring and enforcement – evolution based on science not revolution. Modern sensors could monitor and record the time-temperature easily and inexpensively; they could even lock the cookers until time-temperature had been met. Telemetry could even deliver the data to Defra inspectors’ desks inexpensively. Instead the UK government stupidly threw out the old regs and imposed new ones which meant instead of recycling food waste as pig food, pig feeding switched to primary food and more food waste want to landfill, which as anybody who cares to look can see are diners for seagulls and other carion, which could then carry disease to farmland. Feeding pigs with [properly cooked] food waste has a much better global warming potential than the alternatives.